Saturday morning at dawn I noted than an Osprey (Pandion haliaetus) had already claimed the most prominent nesting site at Occoquan Bay National Wildlife Refuge. 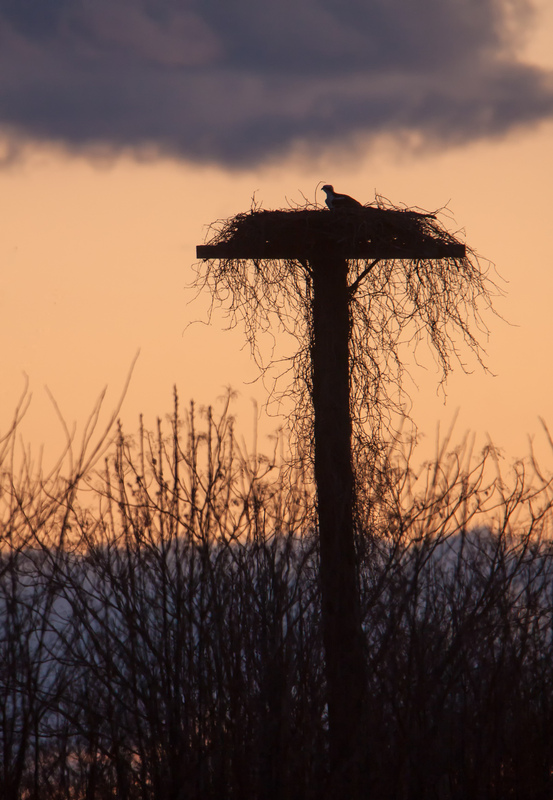 There are several man-made nesting platforms scattered through the wildlife refuge and there are usually some additional osprey nests in trees and one on the top of a hunting blind on stilts in the water. This particular nesting platform is visible from the parking lot, so it was easy to check to see if it was occupied. I love the colours in the photo and the effect of the wispy stuff all around the pole – is that a creeper growing up from below? Thanks, Liz. I think it is some kind of creeper vine, but I am not really sure. The pole and platform are man-made, but I think the vegetation is all natural. Nothing like a home with a view. I love the light in this photo, Mike. In case you are curious, Dan, I took the photo at about 7:15 a.m., just after my arrival in the refuge. I’m curious about the topography of the park. It seems much bigger than the park I visit, but mine is down below a fairly high levy (due east). That changes the lighting. Nice silhouette image of the home and the bird and I agree with Liz, the wispy stuff is a good effect.